Let cookie dough stand at room temperature for 10 minutes to soften. Meanwhile, heat oven to 350°F. Line cookie sheets with cooking parchment paper or spray with Crisco® Original No-Stick Cooking Spray. In large bowl, break up cookie dough. Mix in flour, granulated sugar, cinnamon and ginger with wooden spoon until well blended. Shape dough into 1-inch balls. In shallow dish, beat eggs and water until well blended. In another shallow dish, place pecans. Roll dough balls in egg mixture, then coat with pecans (press pecans into dough if necessary). Place 2 inches apart on cookie sheets. Make small indentation in each cookie, using handle of wooden spoon. Fill each indentation with about 1/2 teaspoon preserves. Bake 11 to 15 minutes or until light golden brown. Meanwhile, in small bowl, mix powdered sugar and bourbon until smooth. If necessary, stir in small amount of water for desired drizzling consistency. 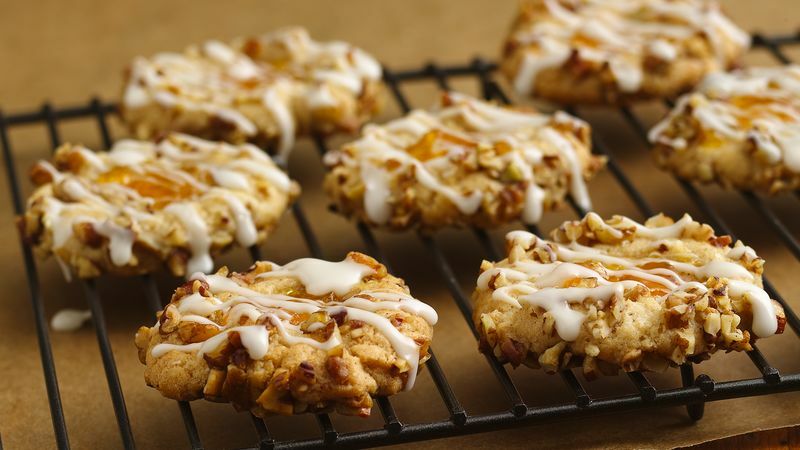 Remove cookies from cookie sheets to cooling racks. Cool 3 minutes. Drizzle bourbon mixture over warm cookies.